Somehow, I feel I ended up in the eye of of storm, or at least a great debate, over my views on the editor’s gut instinct v web analytics. I didn’t know that holdthefrontpage were going to publish comments from my blog, so I was caught off guard when it appeared as the top story. You will have to trust me when I say that I didn’t ask for the blog to appear, it came as a surprise after I only found out via a text. 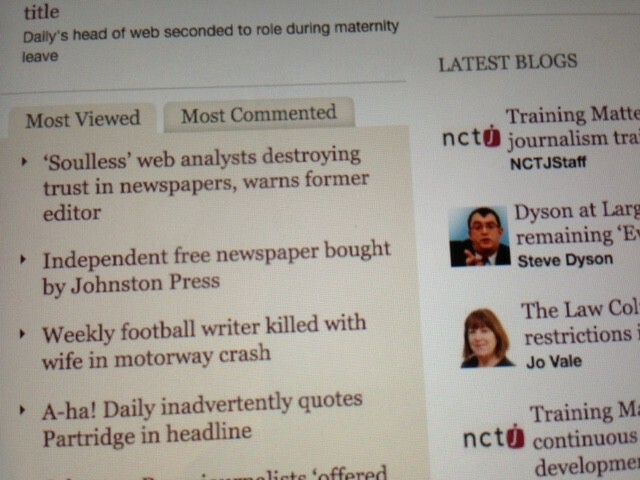 My editor’s gut instinct story was the lead article on holdthefrontpage and was the most viewed that week. From the feedback, I feel I need to attempt to clear up some points. Firstly, I’m not anti-web/digital as suggested by some bloke who doesn’t appear to exist but claims to live in Stoke-on-Trent, where I used to work. I loved the analytics side of the web. It made me think long and hard about content and not take for granted what stories we should go after. I spent sometime talking to staff about whether we had the right content online and in the newspaper, often asking whether a story was worthy of our attention, was it the sort of news/features our readers were really interested in? Often these debates were backed up by the performance of stories online and long discussions on what was the best way to tell a story in this age of multi-skilled, multi-platform journalism. Another person with a fetish for popcorn commented that they would rather trust figures, obviously they must be an accountant. I agree we can trust the figures online, but my main point is what works well online doesn’t necessarily work well in the newspaper. So to base editorial decisions on web analytics takes out the part I called ‘gut instinct’. As our popcorn friend overlooked and I explained in some detail, a lot of this instinct is actually based on performance of newspaper sales over time. Editors know what sells because they have experienced those sales spikes. Where the real instinct comes in is knowing your audience. This is why before the chains were attached 24/7, editors spent hours out in the community talking to people from all walks of life about their lives. So back to my main point which was that we know the audience for online and newspapers is different. I’ve seen how readers react to stories online through the use of, yes, you’ve guessed it, analytics. But you must remember, the newspaper audience is different. While the online analytics are a useful tool in making decisions, they should not be used in isolation. So the outcome of this storm in a tea cup was a mainly thoughtful debate. The most bizarre thing to happen is that one regional newspaper decided after the story appeared to block me re-Tweeting stories from their main account. Not sure if the two things are connected. Strange, but true. I couldn’t put it better myself. It reminded me of the days when the consultants were called in by the old Northcliffe group and started asking how long it took to write a story? They were surprised when I couldn’t give them a straight answer, similarly in the days when hubs were created I was asked how long it took to sub a page? The problem is with fewer and fewer traditional journalists in our news rooms, all of them under pressure to get web hits, stories which take time and effort to get will be spiked by hard-pressed newsdesks. The days of Fourth Estate or investigative journalism have in one stroke been binned by Trinity Mirror as they chase audience figures. Don’t get me wrong, a reporter should share the responsibility for building its audience online and in the newspaper. But the great race to grab a unique user with any old spun-out-of-orbit story (probably not even from the circulation area) can only add up to a dramatic decline in traditional journalistic standards. This brings me back to my earlier theme. Successful stories online are more than often articles with little substance, unchecked, no depth, one-sided, web bait. Before I left newspapers, I became increasingly concerned that there were more and more errors as fewer (if any) checks were made. Stories appeared online with awful mistakes (has anyone read the Mail Online recently?!). It would seem that we are going to end up with a regional press that serves up what I describe as ‘TOWIE’ news. Like the programme and so many others of its ilk, it will be shallow, mindless clap-trap and the world of journalism will be a poorer place.